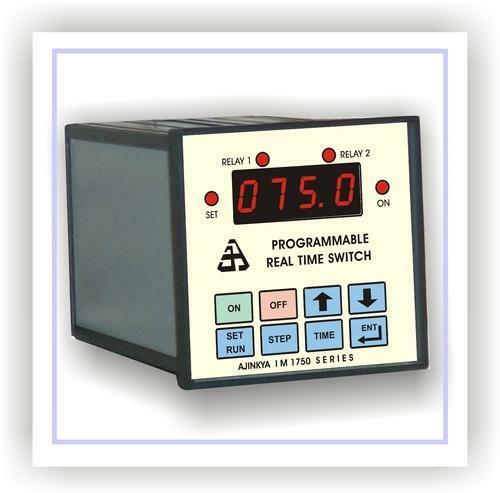 Ajinkya Electronic Systems are also engaged in manufacturing in Real Time Timer. These Real Time Timer switch can be used to switch electrical such as street lamps, garden lights, corridor lights, neon signs etc. as per the time set. The timer has built in almanac timings fixed in nonvolatile RAM so that the user does not have to program the unit every day. Timer offers two outputs to drive contractors of diverse ratings. To achieve desired output these outputs are used with different combination. Timer is provided with manual override facility and optional detachable external keyboard unit that avoids unauthorized access. Ajinkya Electronic Systems are manufactures world time clock. World time displays current local time in any place around the world. World time clock is an indispensable utility for everyone who deals with people abroad or anybody who is keen on knowing what time it is further than locally. These world time clock are specially designed for businesses which are located in different time zones and want to know current local time of their partners and customers. Globally presence customer worldwide, and looks more attractive & eye catching clock then older designed clocks. These clocks are also known as, digital world clock, real world clock, modern world clock, global clock, office clock, time piece, time zone clock, world clock, world time, desktop clock, digital timer, digital clock, etc. These world time clock features a list of some of the largest, more well-known, and most visited cities in the world. Here, you can view time-zone information, and current time of a select group of cities. Ajinkya Electronic System manufacture qualitative Siren Unit which is a time switch that controls factory / school / college / hospital bells. In a factory siren is set as per the timings such as starting of shift, end of shift, lunch time and other events. The unit can be programmed for the weekly holidays so that siren remains off on those days. Ajinkya's range of comprehensive Real Time Timer switch can be used to switch electrical such as street lamps, garden lights, corridor lights, neon signs etc. as per the time set. The timer has built in almanac timings fixed in nonvolatile RAM so that the user does not have to programme the unit every day. Timer offers two outputs to drive contractors of diverse ratings. To achieve desired output these outputs are used with different combination. Timer is provided with manual override facility and optional detachable external keyboard unit that avoids unauthorized access. Ajinkya Electronic System range of multiple Drink Dispensing Counters are specially designed for drinking water dispenser. Its unmatched features have made it different for from all other regular dispensing counters. Ajinkya Electronic systems deal in qualitative electronic programmable Water Level Controller or water level guard which is an advance instrument that control water pumps. It controls the pump as per levels in the underground and overhead tanks. It also protects the pump from power fluctuations. It is a novel and fitting solution for all your Water Problems. These water level controllers have provision to switch on the pump automatically as per time set. As an add-on feature, one time dependent switch is provided so that the common society lights can be controlled from the same unit.